Breakfast at the Montgomery Grille. Montgomery, Massachusetts is a rural, residential town located in Hampden County, situated in the Berkshire foothills. Montgomery’s land area is approximately 15 square miles, bordered on the north by Huntington, on the south by Westfield, on the west by Russell and on the east by Southampton. 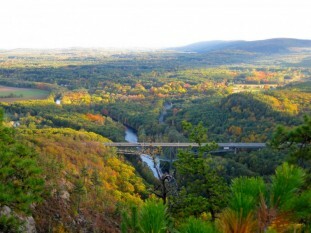 If you’re ready for an exhilarating hike with sweeping views of the Westfield River Gorge, follow Rt. 20 to the trailhead for Tekoa Mountain. From the summit ledges, the cities of Westfield, Springfield and the bridge for the Massachusetts Turnpike are visible from the rugged, craggy summit. The town of Montgomery lies atop a high plain, reaching into neighboring Huntington, framed by Lizzie Mountain to the northeast and Tekoa and Shatterack Mountains to the south and west, respectively. The latter two mountains rise from the banks of the Westfield River, whose banks make up a portion of the town’s border with Russell. Within the town, the Moose Meadow Brook runs from north to south, with the Westfield Reservoir atop the plain and the smaller Tekoa Reservoir near the bottom of the slope of its namesake mountain. Several other small brooks run through the town. You may want to get an early start to your hike with breakfast at the Montgomery Grille. We hear the Portuguese sweet bread french toast is pretty amazing!